Will I Save Money On A Z-Turn? More and more people are turning to zero-turn lawn mowers. Understandably so, as traditional walk-behind mowers can take time and effort as the lawns get bigger. On the other hand, regular riding mowers or tractors, are cumbersome, slow, and are a pain on lawn corners and edges – which usually need further manual trimming. People love their lawns, I know I do. Mowing our lawns, however, not so much. Thus, professional lawn maintenance became big business in many countries. And when a small lawn turns into a couple of football fields, speed and efficiency become key. Max Swisher had similar feelings about his lawn, and mowing in general, in his small town of Warrensburg, Missouri. He went into improving the technology of traditional lawnmowers available then. In 1949, he would invent the first zero-turn lawn mower. A three-wheeled wonder that was able to turn a full 360 degrees. In the coming years, John Regier, Grasshopper Mowers, and Robert D. Davis Jr would further improve the “Z-turn” mower as we know it today. Dubbed the zero-turn riding lawn mower because of its capability to make zero-degree-turns, z-turns have become essential in modern lawn care, both with homeowners and commercial lawn care. The z-turn Is faster, easier to use, and gives you a much cleaner cut leaving no untrimmed corners or sides that are unreachable by conventional mowers. Obstacles also become less of a problem as you can simply and effectively mow around them with a z-turn. The technology behind the zero-turn lawn mower is ingenious but simple. Most z-turns make use of two steering handles called the lap-bar, usually at chest or waist height that control the right and left rear wheels independently. Think of it like a shopping cart. To go forward you’d push with both hands and pull to reverse. To turn right, you would pull with your right hand and push with your left. To turn left, you’d pull with your left and push with your right. Bringing the handles back to neutral will stop the machine. Like a shopping cart (and as easy) the technology of a z-turn allows you to turn within the area that you are on, pulling with your right hand to rotate clockwise or with your left to rotate counter-clockwise. This spinning motion leaves no strips of untrimmed grass giving you that professional striping look! Yes, you will! Although z-turns may be pricier than traditional lawn tractors, the long-term savings are worth the investment. Z-turns effectively cut your mowing time in half which means less gas used and usually less wear and tear for the machine! The number of z-turns and manufacturers available in the market are in the myriads and choosing one for your lawn needs can be difficult. 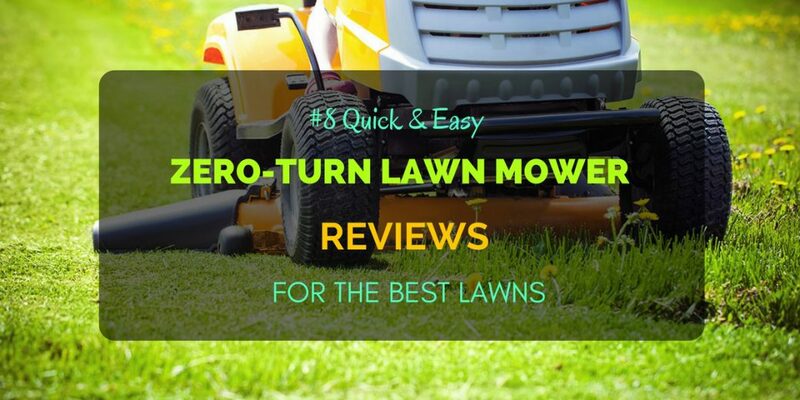 The zero-turn lawn mower reviews below will help you with that! Don’t mow your lawn with a z-turn if your lawn is wet. The weight of the machine may damage the soil. If you have to mow your wet lawn, you can refer to the a﻿rti﻿c﻿l﻿e here. Like regular riding mowers or tractors with different engine sizes, consider the topography of your lawn before purchasing a z-turn. If your lawn has slopes, however, the use of a z-turn is usually not recommended as even the high-end options can lose traction on gentle slopes. Z-turns are designed for lawns and not for fields or pastures. Z-turns also differ in cutting deck sizes, engine types, and steering. This article will make that choice easier for you! Before you start trimming, raise the cutting deck and familiarize yourself with the controls and steering. Consider an entry-level mower if you’re just starting out with z-turns. The most common steering system. Steers like a shopping cart. Z-turns with steering wheels are driven the same way you’d drive your car. A joystick steering system drives a z-turn the same way a video game would be! Fun right? The two styles of z-turns refer to the location of the driver’s seat or stand on the mower. The cutting decks, or range, of zero-turn lawn mowers vary in size, from 42 inches to wider 72inch decks. Again, if you’re a novice, consider an entry-level z-turn with a range of 42 to 46inches. 30-42 inches: great starter z-turns for homeowners with smaller properties. 42-46 inches: z-turns for an area of 1-2 acres. 48-54 inches: Most common and are best for areas bigger than 2 acres. 60-61 inches: Mainly for commercial use and are a great fit for Estate-quality z-turns. 72 inches: Recommended only for areas with vast and mostly flat properties. Let’s get to our zero-turn mower reviews! We’ll be basing these on the z-turn’s durability, comfort, price, user-friendliness and features. I’ve included models from different qualities, types and price points so you’ll have enough options to look through! I, however, chose to forgo the industrial grade of z-turns, for obvious reasons! These are eight different mowers at different price points, for a variety of lawn sizes. So what is the best zero turn lawn mower? The answer depends on the work needed and your experience with these machines. If you’re starting out, consider a z-turn in the entry-level or midgrade categories. If you’re the owner of a professional lawn maintenance company, consider the higher levels. It will not hurt to have one Swisher “Big Mow” in your fleet for that occasional 200-acre client! Still hesitant to buy a brand new z-turn? You can check this link on eBay offering second-hand z-turns. Happy mowing! If you have any comments or questions, leave us a comment below!